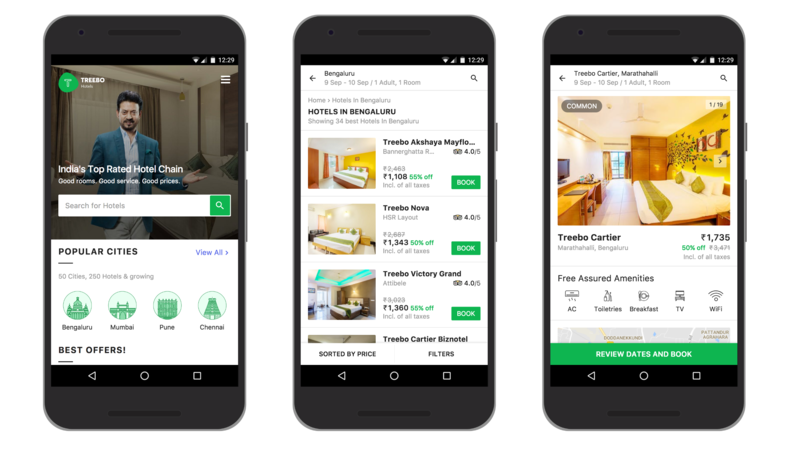 Treebo is India’s top rated budget hotel chain, operating in a segment of the travel industry worth $20 billion. They recently shipped a new Progressive Web App as their default mobile experience, initially using React and eventually switching to Preact in production. What they saw compared to their old mobile site was a 70%+ improvement in time to first paint , 31% improvement in time-to-interactive. and loaded in under 4 seconds over 3G for many typical visitors and on their target hardware. It was interactive in under 5s using WebPageTest’s slower 3G emulation in India. Switching from React to Preact was responsible for a 15% improvement in time-to-interactive alone. You can check out Treebo.com for their full experience but today we would like to dive into some of the technical journey that made shipping this PWA possible. Treebo’s old mobile site was powered by a monolithic Django setup. Users had to wait for a server side request for every page transition on the website. This original setup had a first paint time of 1.5s, a first meaningful paint time of 5.9s and was first interactive in 6.5s. For their first iteration of the rewrite Treebo started off with a Single Page Application built using React and a simple webpack setup. This experience had a first paint of 4.8s, was first interactive in about 5.6s and their meaningful header images painted in about 7.2s. Next, they went about optimizing their first paint a little so they tried out Server-side Rendering. It’s important to note, server side rendering is not free. It optimizes one thing at the cost of another. Treebo used React’s renderToString() to render components to an HTML string and injecting state for the application on initial boot up. In Treebos’ case, using server side rendering dropped their first paint time to 1.1s and first meaningful paint time down to 2.4s — this improved how quickly users perceived the page to be ready, they could read content earlier on and it performed slightly better at SEO in tests. But the downside was that it had a pretty negative impact on time to interactive. This meant that first interactive happened about 6.6s, regressing. SSR can also push TTI back by locking up the main thread on lower-end devices. The next thing Treebo looked at was route-based chunking to help bring down their time-to-interactive numbers. Route-based chunking aims to serve the minimal code needed to make a route interactive, by code-splitting the routes into “chunks” that can be loaded on demand. This encourages delivering resources closer to the granularity they were authored in. What they did here was they split out their vendor dependencies, their Webpack runtime manifests and their routes — into separate chunks. This reduced the time to first interactive down to 4.8s. Awesome! But it did at least have some positive impact on the experience. For route-based code-splitting and this experience, they’re doing something a little bit more implicit. They’re using React Router’s declarative support for getComponent with a webpack import() call to asynchronously load in chunks. Route-based chunking is a great first step in intelligently bundling code for more granular serving and caching. Treebo wanted to build on this and looked to the PRPL pattern for inspiration. PRPL is a pattern for structuring and serving PWAs, with an emphasis on the performance of app delivery and launch. The “Push” part encourages serving an unbundled build designed for server/browser combinations that support HTTP/2 to deliver the resources the browser needs for a fast first paint while optimizing caching. The delivery of these resources can be triggered efficiently using <link rel="preload"> or HTTP/2 Push. Treebo opted to use <link rel=”preload” /> to preload the current route’s chunk ahead of time. This had the impact of dropping their first interactive times since the current route’s chunk was already in the cache when webpack made a call to fetch it after their initial bundles finished executing. It shifted the time down a little bit and so the first interactive happened at the 4.6s mark. The only con they had with preload is that it’s not implemented cross-browser. However, there’s an implementation of link rel preload in Safari Tech Preview. I’m hopeful that it’s going to land and stick this year. There’s also work underway to try landing it in Firefox. 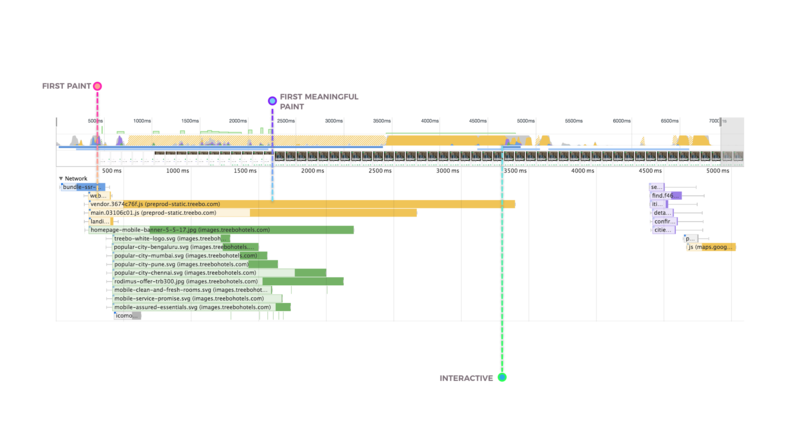 One difficulty with renderToString() is that it is synchronous, and it can become a performance bottleneck in server-side rendering of React sites. Servers won’t send out a response until the entire HTML is created. When web servers stream out their content instead, browsers can render pages for users before the entire response is finished. Projects like react-dom-stream can help here. The benefit of this was that resource downloads started earlier on, dropping their first paint to 0.9s and first interactive to 4.4s. The app was consistently interactive around the 4.9/5 second mark. CSS Stylesheets can block rendering. Until the browser has requested, received, downloaded and parsed your stylesheets, the page can remain blank. 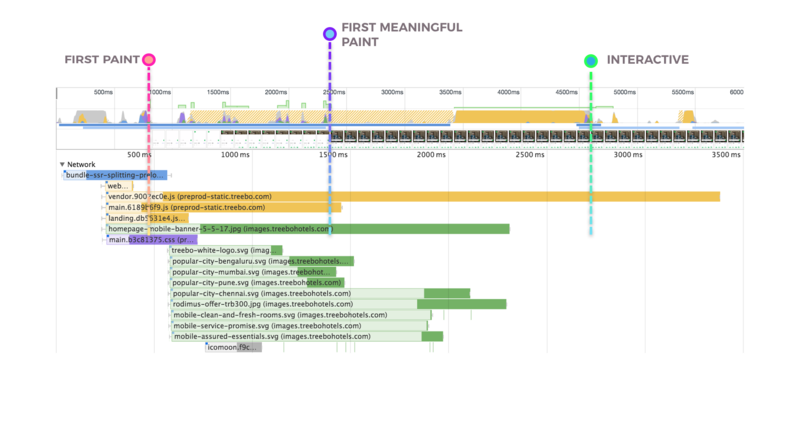 By reducing the amount of CSS the browser has to go through, and by inlining (critical-path styles) it on the page, thus removing a HTTP request, we can get the page to render faster. 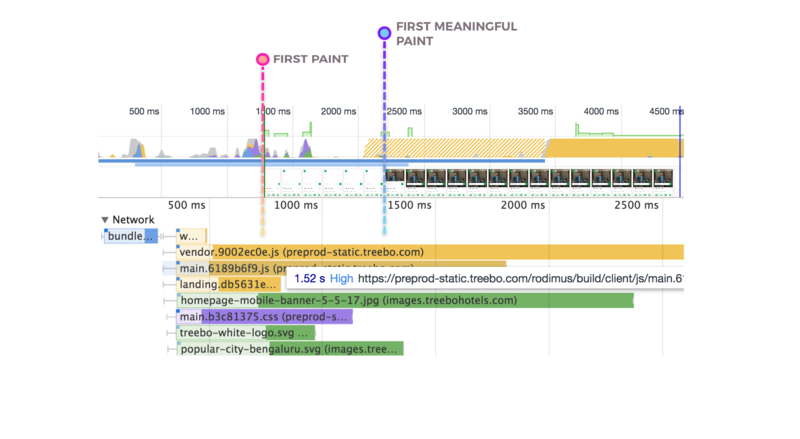 Treebo added support for Inlining their critical-path CSS for the current route and asynchronously loading in the rest of their CSS using loadCSS on DOMContentLoaded. It had the effect of removing the critical-path render blocking link tag for stylesheets and inlining fewer lines of core CSS, improving first paint times to about 0.4s. A Service Worker is a programmable network proxy, allowing you to control how network requests from your page are handled. Next, Treebo wanted to try getting their vendor bundle-size and JS execution time down, so they switched from React to Preact in production. Preact is a tiny 3KB alternative to React with the same ES2015 API. It aims to offer high performance rendering with an optional compatibility later (preact-compat) that works with the rest of the React ecosystem, like Redux. Note: Working with a React codebase and want to use Preact? Ideally, you should use preact and preact-compat for your dev, prod and test builds. This will enable you to discover any interop bugs early on. If you would prefer to only alias preact and preact-compat in Webpack for production builds (e.g if your preference is using Enzyme), make sure to thoroughly test everything works as expected before deploying to your servers. In Treebo’s case, this switch had the impact of dropping their vendor bundle sizes from 140kb all the way down to 100kb. This is all gzipped, by the way. It dropped first interactive times from 4.6s to 3.9s on Treebo’s target mobile hardware which was a net win. You can do this in your Webpack config by aliasing react to preact-compat, and react-dom to preact-compat as well. The downside to this approach was that they did have to end up putting together a few workarounds in order to get Preact working exactly with all the different pieces of the React ecosystem that they wanted to use. Preact tends to be a strong choice for the 95% of cases you would use React; for the other 5% you may end up needing to file bugs to work around edge-cases that are not yet factored in. Notes: As WebPageTest does not currently offer a way to test real Moto G4s directly from India, performance tests were run under the “Mumbai — EC2 — Chrome — Emulated Motorola G (gen 4) — 3GSlow — Mobile” setting. Should you wish to look at these traces they can be found here. Treebo like to implement their skeleton screens using preview enhanced components (a little like skeleton screens for each component). The approach is basically to enhance any atomic component (Text, Image etc) to have a preview version, such that if the source data that is required for the component is not present, it shows the preview version of the component instead. For example, if you look at the hotel name, city name, price etc in the list items above, they’re implemented using Typography components like <Text /> which take two extra props, preview and previewStyle which is used like so. 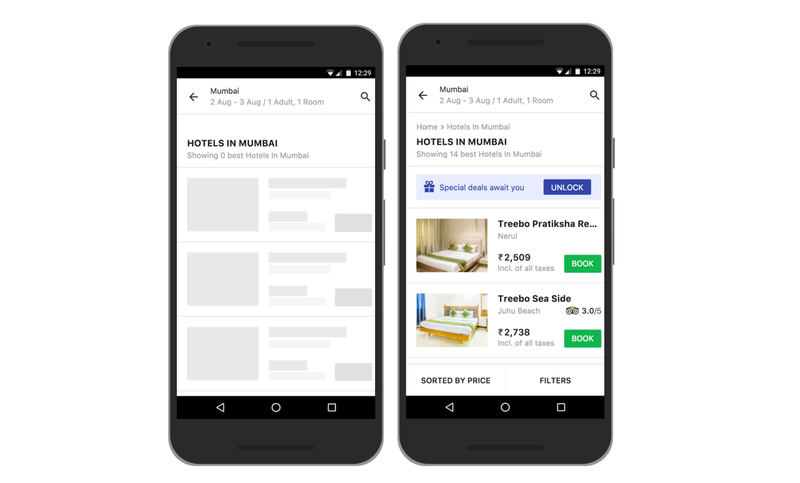 Basically, if the hotel.name does not exist then the component changes the background to a greyish color with the width and other styles set according to the previewStyle passed down (width defaults to 100% if no previewStyle is passed). Treebo likes this approach because the logic to switch to the preview mode is independent of the data actually being shown which makes it flexible. If you look at the “Incl. of all taxes” part, it’s just static text, which could have been shown right at the start but that would’ve looked very confusing to the user since the prices are still loading during the api call. So to get the static text “Incl. of all prices” into a preview mode alongside the rest of the ui they just use the price itself as the logic for the preview mode. This way while the prices are loading you get a preview UI and once the api succeeds you get to see the data in all its glory. At this point, Treebo wanted to perform some bundle analysis to look at what other low-hanging fruit they could optimize. Treebo used webpack-bundle-analyzer to keep track of their bundle size changes and to monitor what modules are contained in each route chunk. They also use it to find areas where they can optimize to reduce bundle sizes such as stripping moment.js’ locales and reusing deep dependencies. Treebo relies heavily on moment.js for their date manipulations. When you import moment.js and bundle it with Webpack, your bundle will include all of moment.js and it’s locales by default which is ~61.95kb gzipped. This seriously bloats your final vendor bundle size. Treebo opted to remove all locale files with the IgnorePlugin since they didn’t need any of the them. With the locales stripped out, the moment.js’ bundled size dropped to ~16.48kb gzipped. The biggest improvement as a side effect of stripping out moment.js’ locales was that the vendor bundle size dropped from ~179kb to ~119kb. That’s a massive 60kb drop from a critical bundle that has to be served on first load. All this translates to a considerable decrease in first interaction times. You can read more about optimizing moment.js here. Treebo was initially using the “qs” module to perform query string operations. Using the webpack-bundle-analyzer output they found that “react-router” included the “history” module which in-turn included the “query-string” module. Since there were two different modules both accomplishing the same operations, replacing “qs” with this version of “query-string” (by installing it explicitly) in their source code, dropped their bundle size by a further 2.72kb gzipped (size of the “qs” module). They’ve also committed to trying to keep that up to date. As they evolve you can take advantage of them as another PWA reference implementation. Some of you might have figured out from the network waterfall graphs before that the website image downloads are competing for bandwidth with the JS downloads. Since image downloads are triggered as soon as the browser parses the img tags, they share the bandwidth during JS downloads. A simple solution would be lazy loading images only when they come into the user’s viewport, this will see a good improvement in our time to interactive. Treebo also realise that while they are asynchronously loading the rest of the CSS for the app (after inlining the critical css), this approach is not viable for their users in the long run as their app grows. More features and routes means more CSS, and downloading all of that leads to bandwidth hogging and wastage. Merging approaches followed by loadCSS and babel-plugin-dual-import, Treebo changed their approach to loading CSS by using an explicit call to a custom implemented importCss(‘chunkname’) to download the CSS chunk in parallel to their import(‘chunkpath’) call for their respective JS chunk. With this new approach, a route transition results in two parallel asynchronous requests, one for JS and the other for CSS unlike the previous approach where all of the CSS was being downloaded on DOMContentLoaded. This is more viable since a user will only ever download the required CSS for the routes they are visiting. Treebo are currently implementing an AB testing approach with server side rendering and code splitting so as to only push down the variant that user needs during both server and client side rendering. (Treebo will follow up with a blog post on how they tackled this). This is an area they’re experimenting with improving. One example is eager loading the next route’s chunk during the ripple animation of a button. onClick Treebo make a webpack dynamic import() call to the next route’s chunk entry and delay the route transition with a setTimeout. They also want to make sure that the next route’s chunk is small enough to be downloaded within the given 400ms timeout on a slow 3g network. It’s been fun collaborating on this write-up. 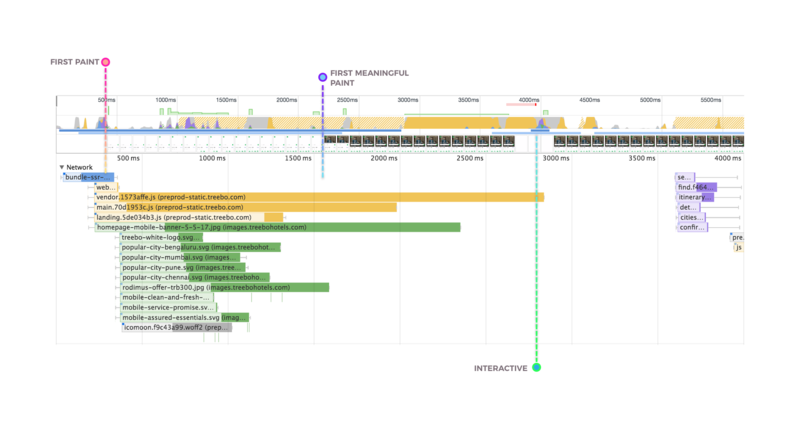 There’s obviously more work to be done, but we hope you found Treebo’s performance journey an interesting read :) You can find us over on twitter at @addyosmani and @__lakshya (yep, double underscore xD) we would love to hear your thoughts. With thanks to @_zouhir, @_developit and @samcccone for their reviews and input. If you’re new to React, React for Beginners by Wes Bos is a comprehensive overview for getting started. Thanks to Jason Miller and Lakshya Ranganath.